There's no greater feeling than finding a highly volatile stock (this strategy can be used on any asset that is volatile), and when it pauses you know exactly how you will trade it when it starts its next big move. 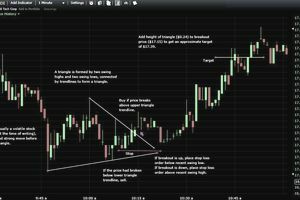 To capitalize on these opportunities you need to know several things, including how to find a volatile stock that is worth trading, when to implement this triangle day trading strategy, and how to actually trade the strategy when everything aligns. The triangle strategy discussed below is ideally suited to volatile stocks. This is because the triangle shows a slow down in the price action. If a stock is typically quiet, triangles will occur frequently throughout the trading day, but in that case, a triangle doesn't indicate the price is going to see big movement when the triangle completes (price breaks out of the triangle). On the other hand, if a stock moves around a lot then a triangle is an anomaly. It shows indecision, and when the triangle completes it offers a precise entry point, stop loss level and target price to capture the transition back to the big moves the stock price typically experiences. There are a number of ways to find volatile stocks, see: Find Day Trading Stocks with the Biggest Moves Using These Filters. Using a volatile stock (or other asset) greatly increases the chances of success using this strategy. If a typically volatile stock is not moving a lot on a particular day, then avoid this strategy. Triangles must be preceded by volatility, which helps indicate that the volatility will continue after the triangle completes. A triangle requires two swing highs and two swing lows, at minimum. The two highs and the two lows are connected with a trendline, with the trendlines extending out to the right. There are three types of triangles which look slightly different but are traded in the exact same way. The attached chart shows a symmetric triangle (see full sized triangle chart). This is when the price makes a lower swing high than the previous swing high, and also makes a higher swing low than the previous swing low. A descending triangle occurs when the second swing high is lower than the previous, but the two swing lows are at the same price (descending upper trendline, horizontal lower trendline). An ascending triangle is when the swings highs are at the same price, but the second swing low is higher than the previous (horizontal upper trendline, ascending lower trendline). Make sure there is strong movement before the triangle forms. As soon as you see a triangle pattern forming, draw the trendlines. If the price breaks above the upper trendline, buy and place a stop loss below the most recent swing low. Alternatively, the stop loss is placed below the lower triangle trendline, although this will increase risk and giving the trade this much room typically isn't required. If the price breaks below the lower triangle trendline, sell and place a stop loss above the most recent swing high. To calculate a profit target, take the height of the pattern (high point minus low point) and add it to the breakout price in the case of an upside breakout, or subtract the height from the breakout price in the case of a downside breakout. Referring to the attached chart, the height of the triangle is $0.24 at its widest point. Add this to the price where the stock breaks out, which is $17.15. The resulting target is $17.39. Since the trendlines may be angled, the breakout price will change over time, therefore, you'll need to be actively watching for a breakout. Set the stop loss immediately, then put out your target order once it's calculated. Triangles are often seen during the U.S. trading session lunch hour; volatility typically declines during this time and then picks back up following lunch (see Common Intraday Stock Market Patterns). Hunting for triangles during the lunch hour--in stocks that have been volatile in the morning--is a worthwhile endeavor. The target is an estimate, not an exact science. Before taking a trade, note the amount you have at risk, and the potential profit based on the triangle height. Only take trades if the reward is twice as much as the risk, or more. In the depicted example, the profit was three times greater than the risk. If there's a very strong move followed by a very small triangle, you may wish to hold the position for a bigger profit which is more proportionate to the big move which preceded the triangle. For instance, a $1 sharp move followed by a $0.10 triangle (height), is likely to move more than $0.10 once it breaks out (this formation is actually called a "pennant"). Look to make $0.40 or $0.50+ on this type of setup...and your risk will still only be several cents! This strategy should only be used in stocks (or other assets) with volatility, and there should be lots of movement preceding the triangle. The reward potential based on the estimated profit should exceed risk by a minimum of 2:1. Isolating these patterns in real time takes practice. Practice in a demo account--trading the breakouts, placing stop losses and quickly calculating the targets. You should be consistently profitable trading triangles in a demo account before attempting to trade them with real capital. Want another strategy, for trading trends? See Engulfing Candle Day Trading Strategy.